Lindsay E. Hogan has experience in complex commercial litigation, representing corporate and individual clients in federal and state court and in arbitration proceedings. 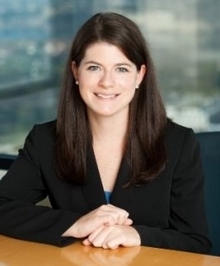 Prior to joining Grossman LLP, Lindsay was an associate in the Business and Commercial Litigation Department at Gibbons, P.C., where she represented hedge funds, banks, and broker-dealers in all aspects of litigation arising out of complex financial transactions, and before that she practiced at a prominent California law firm. Lindsay earned her law degree from Georgetown University Law Center, where she was a member of the Georgetown Journal of Legal Ethics and participated in the Institute for Public Representation. Lindsay earned her bachelor’s degree from the University of California, Berkeley.